Product prices and availability are accurate as of 2019-04-22 02:09:36 UTC and are subject to change. Any price and availability information displayed on http://www.amazon.com/ at the time of purchase will apply to the purchase of this product. 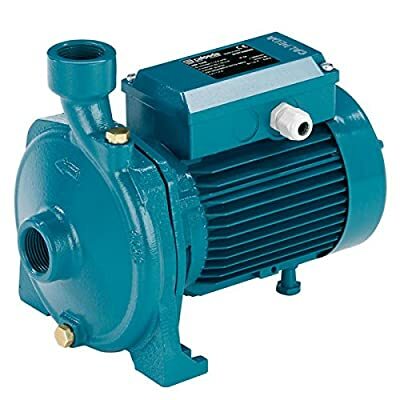 Calpeda NM1S 05C16S End Suction Centrifugal Pump 1 Phase 0.5HP 230V - NMM 1/S-60 230V CONSTRUCTION Close-coupled, centrifugal pumps; electric motor with extended shaft directly connected to the pump. Single-impeller Two back-to-back impellers (with axial thrust balancing) Connections: threaded ports NPT. APPLICATIONS For clean liquids without abrasives, which are, non-aggressive for the pump materials ( solids content up to 0.2%). For water supply. For heating, air-conditioning, cooling and circulation plants. For civil and industrial applications. For irrigation. OPERATING CONDITIONS Liquid temperature from 14 F to 194 F. Ambient temperature up to 104 F. Total suction lift up to 23 ft. Maximum permissible working pressure up to 145 psi (232 psi for pumps NMD). Continuous duty. MOTOR 2-pole induction motor, 60 Hz (n Ö 3450 rpm). Three-phase 230/460 V. Single-phase 115/230 V, 115 V, 230 V. Insulation class F. Protection IP 44. MATERIALS Pump casing: Cast iron. Lantern bracket: GJL 200 EN 1561. Impeller: Brass CW510L (lead free public LAW 111-380). Shaft: Cr steel AISI 430. Cr Ni steel AISI 302 for 1 - 1.5 - 2.5 - 3 HP. Mechanical seal: Carbon- Ceramic- NBR. SPECIAL FEATURES ON REQUEST Other voltages. Special mechanical seal Higher or lower liquid or ambient temperatures.